The central motif for the 5-cent "Local" or "Richmond" print is a portrait of Jefferson Davis, designed and engraved by Jean Ferdinand Joubert De La Ferté for De La Rue. 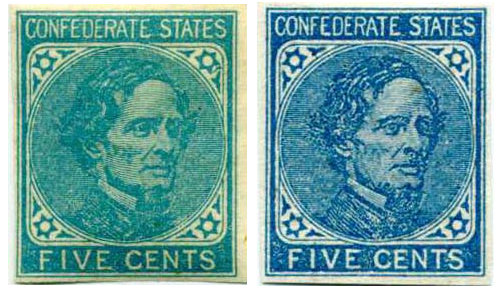 Based on incomplete records, there were 36,250,000 CSA 7-L and CSA 7-R stamps printed from one four-subject electrotype plate, panes of one hundred. Plating is incomplete as complete panes still remain and no one so far has seen the need. This will likely change in coming years. Stamps were all imperforate. CSA 7-L (Local print on London paper) stamps were originally printed on the thin hard-surface paper with colorless gum and ink supplied by De La Rue on the same printing plate as the "London Print." Later productions, CSA 7-R (Local print on Richmond paper) stamps were printed using ink and paper procured in Richmond. The color ranges across all shades of blue, usually dark in color. Although printed from the same plate, they can generally be distinguished by the coarse, fuzzy impression and / or the presence of plate flaws. The thicker paper is also a good indicator on off-cover stamps. There are a few collectible varieties such as the poplar "White Tie", filled in margins and scratched plate varieties. CSA 7-L is by far the more common of the two printings. The 7-L (Richmond print on London paper) is cellulose, which can be determined by XRD (X-ray diffraction). The dry London ink pigment was mixed with animal fats, as determined in recent years by FTIR Spectroscopy (Fourier-transform infrared spectroscopy). The 7-R (Richmond print on Confederate paper) contains Kaolin, as determined by XRD. London paper does not. There is also a high surfactant variety of CSA 7-R which makes up about 11% of the production, but it is impossible to deduct without expensive equipment. It is not something detectable with the naked eye. Early local prints on London paper can be difficult to distinguish from the London Prints, especially if no gum is present or used on cover. If gum is present, it has a slightly more yellow cast than CSA-6. The earliest recorded date of use is July 13, 1862. This has changed several times in recent years, with consistently earlier dates. The most typical use is of pairs paying the 10-cent letter rate after July 1, 1862.